We checked into our hotel, which is in the heart of the city, near many tourist sights, near the train station, and on the street that contains all the touristy souvenir shops, fast-food joints, etc. The hotel is at the nicer end of the street however, and also has a famous, old, traditional-dutch-food restaurant attached. The desk-clerk told us he would upgrade our room, which was nice. He was quite helpful and friendly, in contrast to the desk-clerks in our Russian hotel, and spoke excellent English. In fact, everybody in the Netherlands speaks excellent English. We haven't found a single person who doesn't. In the seats in front of us on the plane, an English person was talking to a Dutch person sitting next to him, and the Dutchman said that the Dutch and the Danish are known to be the best English speakers on the continent. After settling our stuff in our room, we went out to see the city a bit and find a place for dinner. First, we walked along the street our hotel was on. It was kind of tacky: Fast-food joints, touristy souvenir shops, change-making stores, a casino, lots of tourists. Not very attractive. We walked back and then walked another smaller street with several smaller nicer-looking restaurants We went into a sort of pub and had dinner. Donnie ordered a chicken-wrap and I ordered chicken-kebobs in peanut sauce (the Dutch have a tradition of eating Indonesian-like food, since they once ruled the Dutch East Indies and imported dishes from there). The food was pretty good. We then walked around some more and went back to the hotel. 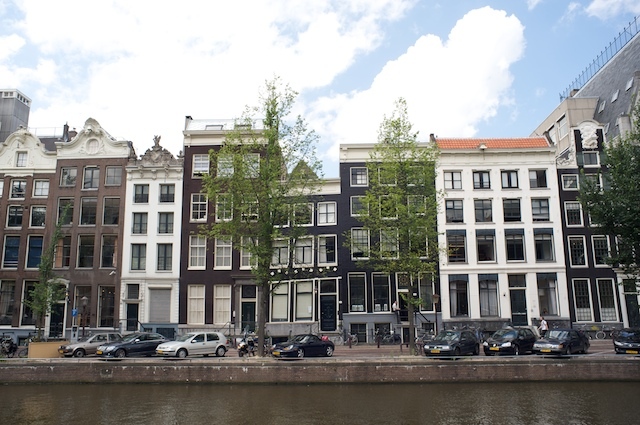 By this time, Donnie and I felt that our original plan to stay three nights in Amsterdam and then pick up a rental car and drive around the country was maybe not a good idea, since I had no driver's license and Donnie would have to do all the driving. We had seen on our drive from the airport to the hotel that driving in Amsterdam was extremely difficult. We decided to stay in Amsterdam and cancel the rental car, so we checked with the desk-clerk and reserved the hotel room for an additional 4 nights. Did I describe the trip from the Airport to the Hotel? No? Well it was like a video game where you have to drive through city streets at high speed without slowing down and where all the streets are narrow, filled with thousands of bicyclists and pedestrians who ignore the cars, stop-signs, traffic lights and act like they own the road. The driver never slowed down even when people or bicycles were right in front of our car. We were surprised that he didn't kill about 3 or 4 dozen people. The next morning, Tuesday, July 28, we awoke, washed, dressed and went down to breakfast which was included with our room. (It is actually a rather expensive addition to the room price, but our travel agent booked our room with breakfast included. Many European hotels offer a buffet breakfast for free, but this one didn't). After breakfast, we went to a nearby mini supermarket, suggested by the desk clerk, to buy a strip of tickets for the Tram/Bus/Metro system. We then took a tram one stop to the Central Railway station, which had a tourist information center nearby. We had wanted to ask a few questions at the information center, but the place was jammed. They have a take-a-number system and our number was 100 away from the number that was currently displayed. We waited a while, bought a city map (for 2 euros, which we thought was overpriced), and after a while decided to leave. 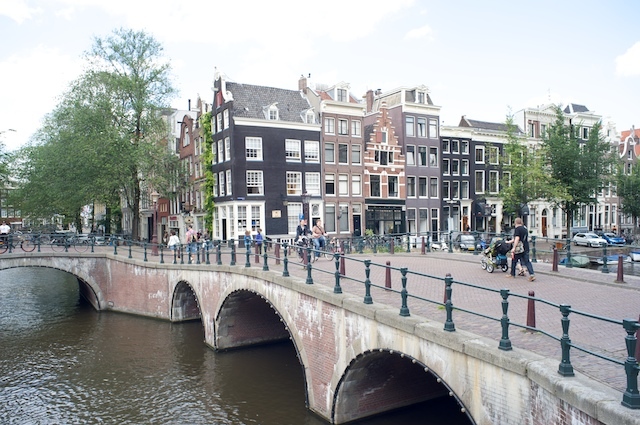 We also wanted to go to a Canalbus station, because the travel agent had gotten us a voucher which entitled us to a pass to the Rijksmuseum, which is the large, major art museum in the Netherlands, and also a 24-hour hop-on hop-off pass for the Canalbus tour. The voucher had to be exchanged for actual tickets at the Canalbus stop. We did this, stopped at a room next to the tourist information center which sold discount 24, 48, or 96 hour passes for the mass transit system, which we bought, and then decided to take the Canalbus tour. 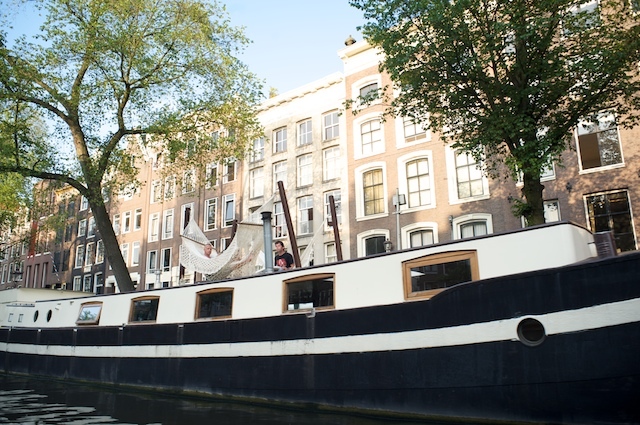 Amsterdam is crisscrossed by beautiful canals. It seems to me that Amsterdam is what Venice was in its heyday. The central area of Amsterdam is ringed by 3 concentric canals which are interconnected by lots of smaller canals. There are more than 1200 bridges. The canals are lovely. They are narrow, and clean (as is almost everything in the city), and have boats of every size and description in them. 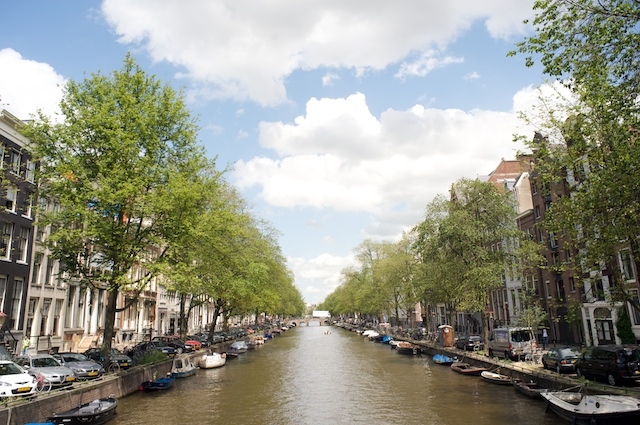 Each canal is bordered on both sides by small, tree-lined streets (one lane only) which are used by the residents of the lovely old houses that line the canals. All the streets and the sidewalks are made of brick. This part of the city is very tranquil and relaxing and we spent a lot of time just walking and taking pictures. We took LOTS of pictures because the city and the canals and the houses are so pretty. Finally, at about 7:30 we decided to take the Canalbus back to the area of our hotel. While we were waiting at the Canalbus station for the boat to arrive, we watched dozens, if not hundreds, of small boats slowly motoring or paddling down the canal. There are few sail boats because all the bridges are too low. 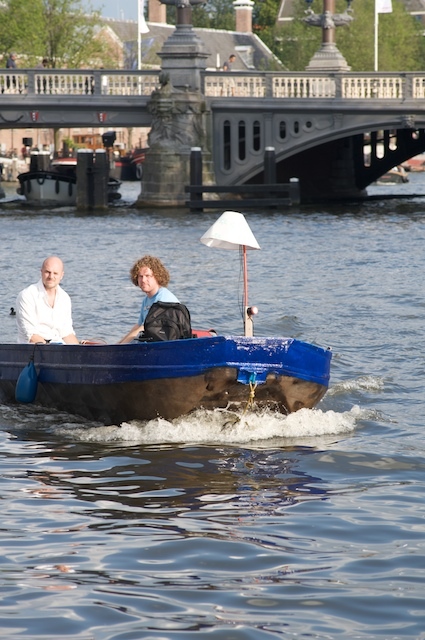 It seems that the residents like to take their boats down the canals in the late afternoon. We spent the evening in the hotel room writing about our experiences until midnight. Did I mention the bicycles? Amsterdam has bicycles. Millions of them! Seriously, there are many, many more bicycles than cars. 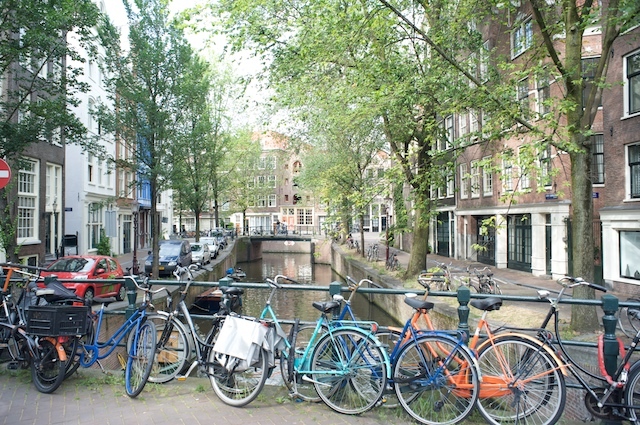 Every street is filled with parked bicycles. Every street has a bike lane. Near the central train station is what looks, at first glance, like a typical multi-level parking garage, but it's for bicycles! It must hold 5 or 10 thousand bikes. There are special stop-lights for the bicyclists, and they stop at them. 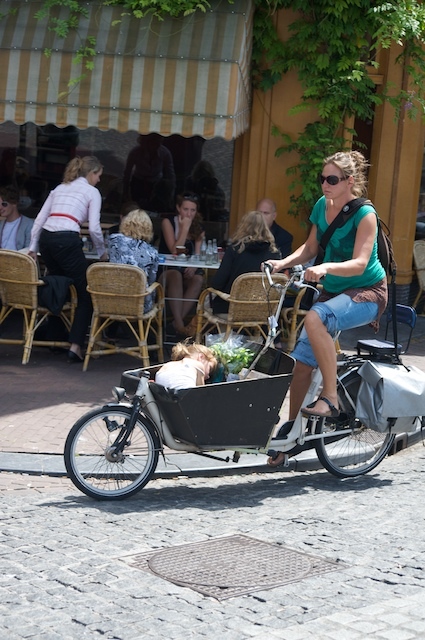 There are special bicycles that have a wheelbarrow-like bin between the handlebars and the front wheel, for carrying packages or kids. The handlebars are attached via a chain-drive to the short front wheel in front of the bin. We saw a number of women cycling with children in the bin. On Wednesday, we woke to a cloudy day, with a little drizzle. After breakfast, we took a tram from the front of our hotel to the central train station again, and took a different Canalbus route, since it was raining and our Canalbus passes were good until noon. Afterward, we walked to the Rijksmuseum. When we got there, we discovered that something in one of our guide books had been true: The main museum was closed for renovations until the Fall of 2009. There was only a temporary exhibition of some of the museum's highlights. We did get to see several Rembrandts and three Vermeers, and enjoyed what was available. After the museum, it was already 4:30, and we were tired, so we took a tram back to the hotel to recuperate before dinner. Note: The film version of this epic story is already in the works. The cast will include Sean Connery playing the role of Jeff (bald and overweight) and Catherine Zeta-Jones as Donnie. Coming to your local theaters this fall. Rated R (for ridiculous).